The Siskiyou FilmFest team is excited to announce that the full film line-up for 2019 is now available! Get ready for a jam packed evening of fantastic short films screened at the Grants Pass High School Performing Arts Center on Sunday Feb 10th. Doors open at 3PM and films begin at 4PM! Come early to bid at the Silent Auction full of awesome prizes, take action at the community showcase with our conservation allies, eat some delicious street finger foods made by Chef Kristen and the Jefferson Farm Kitchen, and get some limited edition Siskiyou Film Fest swag at the KS Wild table. Don’t fret if you can’t make it early, these will all be available during our intermission as well! Run Wild Run Free takes the viewer through the history to the present of Wild and Scenic as told through experts, grassroots organizers, whitewater enthusiasts, and members of the Nez Perce tribe in Idaho. A documentary that reveals how fire suppression and climate change have exposed our forests and wildland-urban landscapes to large, high-severity wildfires, and explores strategies to mitigate the impact of these fires. A short, expressionist documentary, exploring the relationship between Cedar and three Indigenous women who work with it, weave with it, and live with it. Watch this poetic expedition between two islanders, one from the Marshall Islands and one from Kalaallit Nunaat (Greenland), connecting their realities of melting glaciers and rising sea levels. 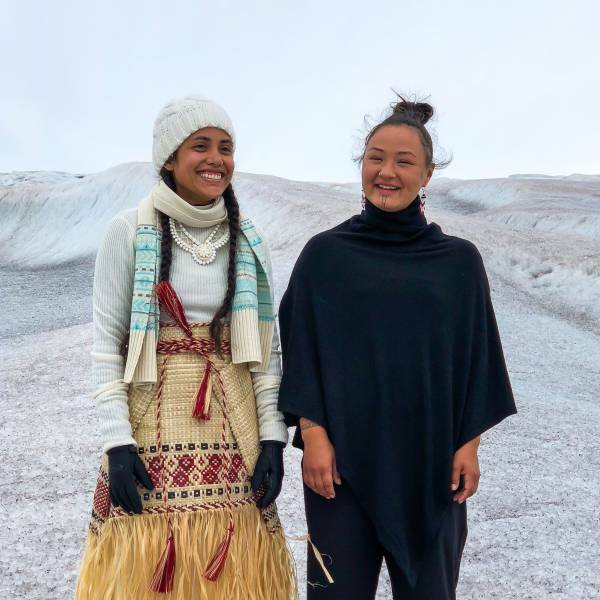 Kathy Jetñil-Kijiner and Aka Niviâna use their poetry to showcase the linkages between their homelands in the face of climate change. Through this video we get a glimpse at how large, and yet so small and interdependent our world is. Working under the moniker Jetsonorama, Thomas regularly celebrates the beauty of a people whose land has been mined and poisoned, cut up and sold off. Blowing up and wheat-pasting his black and white photos onto the sides of merchants’ stands, abandoned buildings, and mobile homes, Thomas creates work that allows community members to see themselves represented at monumental scales. By day, Thomas is a primary care physician at the Inscription House Health Clinic, located in the western part of the Navajo Nation, where he lives. In his free time, Thomas installs massive photo murals on and off the reservation, depicting his Navajo neighbors — from sheepherders to grandmothers. “Especially on the reservation, the work is a conversation,” says Thomas. “I’m trying to help create an environment of wellness within the community." Featuring an emerging young scientist from the Lower Elwha Klallam Tribe, Renewal is a heart-warming story of transformation and restoration. Supported by HHMI and Tangled Bank Studios, this short film is part of HHMI’s “Think Like A Scientist” series. It is also a follow-up story to the award-winning feature film, Return of the River, by the same Producer, chronicling the largest dam removal in history. In honor of the 50th anniversary of the Wild and Scenic Rivers Act, Senator Tom Udall, Ted Roosevelt IV, American Rivers President Bob Irvin, and river guide Austin Alvarado provide insightful commentary on the state of river conservation. Every morning, millions of Americans start their day with a steaming cup of coffee. They sip the stimulating brew, all the while unaware of the forces of climate change, immigration, and women’s issues that swirl together in their cup. For our short documentary, Dry Roast, we went to the source of some of the best coffee in the world in the Western Highlands of Guatemala. There, we found women fighting to sustain their coffee farms in the face of crippling impacts from climate change. Left behind by their husbands and several of their children, many of whom migrated to the U.S., they are now on the front lines of the battle between climate change and their livelihood. Filmmaker Ben Masters (UNBRANDED) goes into the heart of the Big Bend, the last true wilderness in the state of Texas to consider what effects building a border wall might have on wildlife dispersal, migratory corridors, and access to the Rio Grande, the only water source in a harsh desert environment. Ben Masters is a filmmaker, writer, and horse packer who splits his time between Bozeman, MT and Austin, TX. He is most known for Unbranded, a documentary in which he and three others adopted mustangs and rode from Mexico to Canada to inspire wild horse adoptions. Masters studied wildlife biology at Texas A&M University and sits as the wildlife management chair on the BLM's volunteer Wild Horse & Burro Advisory Board. He writes for National Geographic Adventure, Western Horseman, and is a published author. Masters is an award-winning film producer with Audience Awards at Telluride Mountainfilm, Banff International Film Festival, Hot Docs International Film Festival, the Equus Film Festival, and others. He is currently directing a series of character driven conservation short films. Producer, director and founder of Grizzly Creek Films Thomas Winston runs a full service production company based out of Bozeman, Montana. Winston’s projects have included creating original series for National Geographic Channel, The History Channel and PBS. Winston is the director of "Great Old Broads for Wolves" which tells the story of a group of women working to protect wild places and things -- including one of America's most iconic animals. The Rocky Mountain Wolf Project is committed to restoring the gray wolf to the great National Forests and other public wildlands in western Colorado. After the successful reintroduction of gray wolves into the greater Yellowstone ecosystem, there's just one missing link in the Rocky Mountains— one state whose public lands are still haunted by the missing howl: Colorado. Older PostSiskiyou Film Fest Goes LIVE!